Google+ Reading Teen: Dream Dark: A Beautiful Creatures Short Story!! Dream Dark: A Beautiful Creatures Short Story!! We got a really exciting email today!! An original Beautiful Creatures short story available as an exclusive e-book and downloadable audio—coming August 2nd! This all-new story focuses on the fan-favorite character Link who undergoes a heart-racing transformation. Wounded during a climactic battle, Link slowly realizes that being bitten by a Supernatural does more than break the skin—it can change a person, inside and out, turning him into a creature more and more like the dark creature who injured him. As a special bonus, DREAM DARK will include an exclusive sneak peek at the first five chapters of BEAUTIFUL CHAOS. And as a special bonus, Dream Dark will include the first 5 chapters of Beautiful Chaos ! 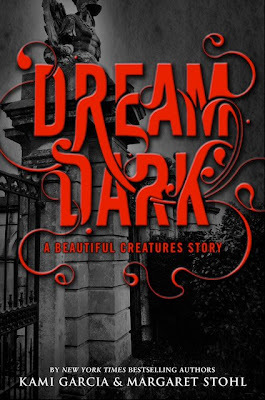 DREAM DARK: A BEAUTIFUL CREATURES STORY is a never-before-seen short story, created as a prequel to BEAUTIFUL CHAOS, the hugely anticipated third book in the series, which goes on sale October 18. The e-book is set to release on August 2 for $1.99, and will be available for download across all digital platforms. Amy is in Mexico right now, so she doesn't even know, but she's going to flip when she finds out!! I can't wait to tell her!! Are you a Caster Girl? Will you be snagging an e-copy on August 2?